This entry was posted in Stocks Reservoir Fishing Reports on March 30, 2018 by staff. Sport: There were a few more trout caught today both from the bank and the boats. Ken Whiteside landed his 3 fish between Hartleys and the jetty. Ken caught all his fish on a cats whisker. Mr Cocker caught a brace of rainbows fishing similar areas but found his best pattern to be an olive booby. Alan Daniels caught 3 fish and had a good few other chances whilst fishing from Bens beach. Alan caught all his fish on a sinking line and black and green nomad. 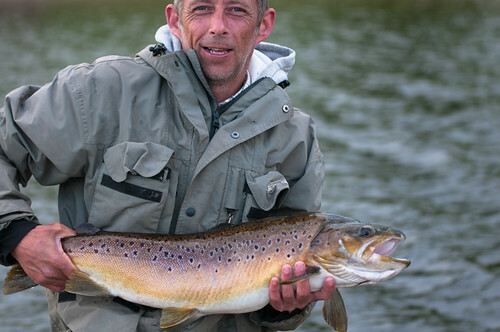 The best boat catch went to Bob Fitzpatrick and Steve Bland who landed 7 trout between them. They had a lot of other action in the form of pulls and follows. They also caught some decent sized fish with their biggest being a 6lb rainbow. Most of their fish were caught up in the northern shallows with pink or white snakes and black and gold zonkers fished on sink tip lines. Good angling. Syotw Paul. This entry was posted in Stocks Reservoir Fishing Reports on March 29, 2018 by staff. Sport: There were a few anglers to land a couple of fish and have a number of other chances today. Out on a boat was Ricky Newbolt who caught up in the northern shallows. Ricky tempted his trout on big lures on a sinking line with other fish bumping and following his flies. Fishing the bank around the jetty was Bill Stanley with his 2 trout. Bill caught on a lime green booby fished slowly on a slow sinking intermediate line. Another angler with 2 fish was Derek Fitchie. Derek caught his fish on a Montana on a floating line. Mike Ward caught his trout from Hartleys bank. Mike opted for a floating line with both his fish falling to a sunburst hummungus. The Best catch however went to Mark Diamond who caught his 4 trout whilst fishing at barn quarry. Mark caught all his fish on a peach booby fished slowly on an intermediate line. Syotw Paul. This entry was posted in Stocks Reservoir Fishing Reports on March 26, 2018 by staff. This entry was posted in Stocks Reservoir Fishing Reports on March 25, 2018 by staff. The Fishing is Picking Up. The fishing has woken up today at Stocks. 🙂 Paul Miller fished from Bell Point along Hartley’s to catch 8 rainbows this morning. Used an SSI line and a black n green taddy with a mixed retrieve. Paul counted it down to 15-20 and then twiddled it back with a few twitches here and there. Tony Taylor wasn’t out long before he reutrned to two 6lb rainbows and another at 3lb. Tony fished a Di3 with a cat booby and two cormorants. He had one fish on every pattern. Ps The fishery is still open to non competing anglers as well. This entry was posted in Stocks Reservoir Fishing Reports on March 24, 2018 by staff.